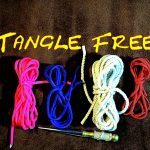 This really has to be one of the quickest and easiest knots to tie! 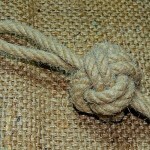 Basically the completed knots consists of three bights that are inter connected. This is sufficient for one rope to be used to hoist up the end of another rope high into the canopy. My understanding is that the Quick Hitch is often used by Arborists purely to pull up additional ropes. Yes, this is a way of joining two ropes together, but this method should never be used to lift anything other than another rope. 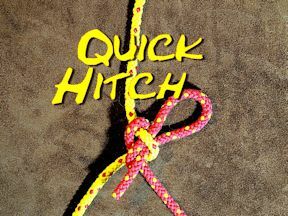 The Quick Hitch is an excellent choice for lifting rope only, if any other weight is applied the hitch will slip. 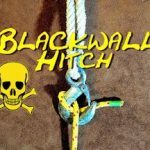 Once the quick hitch has been applied the main rope, the main rope can be pulled up with the secondary rope attached. 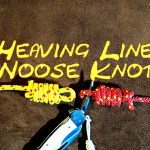 Once the operator is able to get hold of the secondary rope, this can be released from the main rope with one hand and single tug on the secondary rope.